Race to the FINISH!!! Can we do it??? Click on image to go support our KICKSTARTER now! In the first 24 hours - we raised $1185!!!! That's the GREAT news! But the IFFY news? Well, as you know, with Kickstarter - it's all or nothing! So now we need to raise almost $9000 more in 24 days and I believe we can do that! because I believe in this project! Not only is it an AMAZING project by itself, but we will be showing our Monkees how to utilize @actifit, @dtube, and even some NEW projects on the horizon that give our Monkees their service points! Isn't that what Steemians are thrilled to do? Utilize the great projects we have, while supporting other great projects on the Steem platform? Biggest question we have had so far: How can we play?!?! So here is the quick and easy answer! Sign up for a separate Steem account that a Monkee (child between 8-14) will post and a parent will supervise! Monkees earn points by performing 5 REAL LIFE tasks a day in the following categories: Health, Environment, Service, Hobbies, Future Career. When they reach 100 points, they go to an online treasure map and spend their points to "dig". Any prizes they reveal are their rewards! That is how simple it is! Know a family that would like their child to play our game? Go to Spunkee Monkee to find out how! We only have 100 spots available for our Beta Test beginning on Feb 1! Get your account signed up now! WANT TO MAKE SURE THE MONKEES HAVE THE BEST GAME EVER? Donate $10 on our Kickstarter here! Thank you for your support of Monkees and Steem!! Please send that Kickstarter link to other families who would love to be a Monkee Family! HEY STEEMIANS! Prefer to support with $10 of steem? Sure! We'd LOVE that! Use our FUNDITION link to support us there and grow our Steem community!!! Thank you for all of your help!!!!! I'm Sooo proud of you sis 🤗❤️ this is such a great project and I looove the name soo much. Stay as you are and I'm excited to follow this project 🤗❤️🤗 Love you! I'm so happy that this is happening!!! thank you for your constant support :) Love you back! Hey! I take a look, your project sounds great! Hey thank you so much!!!!! Looks like a great project! Hopefully many kids have a great educational experience here! I'm on board!! I think its going to be a FANTASTIC experience for kids. The families from our Alpha test had such a great time, and the Monkees had so much fun! Beta is only adding in MORE fun and MORE prizes! really should be awesome! Do you have kids in that age group?? :) If you do - come be a part of it! Start where you are, Use what you have. Do what you can. That is EXACTLY right!!!! And no matter what...we.plan to move forward! Welcome Wagoners know how to bring GREAT ideas to the platform and have the DRIVE to make it happen!!!! Oh no!! hives - :( was he anxious about something??? i hope he gets better! This started around 3 years ago..
That doesn't sound pleasant at all for him!!! Great!, I will partner with you sooner. I have one question. Will you create your own Steem front-end and signup system? Because you must be 13+ to use Steemit.com. I heard in the past that some account creations were blocked, because users were less than 13 years old. I can't change the campaign on Kickstarter with that link - but I will update my website with that for sure! Please do share this with any family that you think would love this project! Our alpha monkees LOVED it and are back for Beta! We'd love to include more countries in the fun! Please do spread it around to social media too??? every bit helps!! Now this is a project i can get behind!, it really sounds like something i would paricipate when time allows. Other than that, i was just passing by, you, know, just casually, to say Thank You! Your contribution towards the ''Santa Venezuela'' initiative truly made a difference for us, it put food in our tables and that's thanks to you are a big part of that, you're very thoughtful. I wish you a very happy year. And happy to support friends around the world! It makes me feel amazing that I can actually SEE the difference that it made in someone's life!!! Very very awesome!!! Part of Spunkee Monkee will also give the Monkees a way to do this too! To help support their Monkee friends around the world 😊 I'm very much looking forward to that!!!! Wow! Congratulations on raising so much in such short time!! Love you twinnie. What a wonderful start to the year. I still wanna be an adult beta tester!!! What a great program!!! Can i donate 2 sbi to spunkee monkee? Already reateemed. Realistically i will never get to kickstarter right now and actually donating. I can just send over some steem though, if you prefer to sbi. I have been trying to make an online purchase for about a week now! Wow! Thank you so much @frostyamber!!!! It is absolutely ok to send the steem here - I appreciate it and and so grateful for your support! It's special when my friends and family support me - but it really surprises and delights me when someone I haven't met is willing to support this project! Wish you much success with this project, wish I had a little monkey around but they're all grown up AND they're not bringing any little monkeys into the world yet!!! Oh that would be awesome!!!! 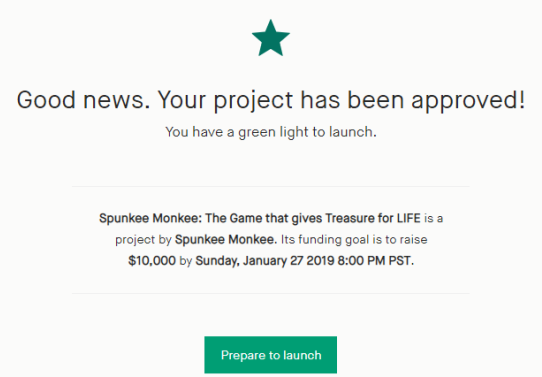 You have successfully backed Spunkee Monkee: The Game that gives Treasure for LIFE for $10.00. This project is one step closer to becoming a reality thanks to you. Help spread the word! Thank you!!!! This means so much to me!! Good luck! I wish you great success!